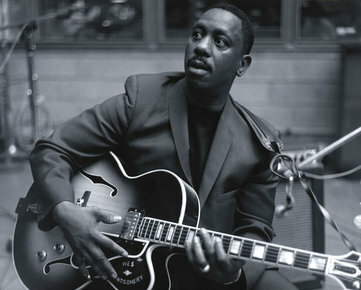 Wes Montgomery was an American guitar jazz player, considered one of the greatest jazz guitarists of all time. 1- In single note lines using scales and modes. 2- By playing octaves, he was the master of octave playing and widely know about this. 3- By playing block chords. Wes Montgomery played almost exclusively on a Gibson L-5 CES plugged most of the time into Fender amps ( super reverb, twin reverb, deluxe). He also played on Gibson L-7, Gibson L-4, Es-175, ES-125D. He died of a heart attack in 1968 and leaves behind an impressive discography, a Bible , an encyclopedia for all jazz guitar players. Stay informed of the latest transcriptions, subscribe to the newsletter. This jazz guitar lesson with TABS, analysis and standard notation provide 10 easy lines of Wes Montgomery from west coast blues. Here is a Wes Montgomery jazz guitar solo transcription with guitar tabs and analysis from the jazz tune "Full house". This is a Wes Montgomery jazz guitar solo transcription with tabs from full house.